Friends, if you’ve followed this blog, then you already know that I’m kind of obsessed with backup and storage solutions. I have backups of my backups of my backups. I use MS Onedrive, GoogleDrive, Dropbox, Carbonite. I have two dedicated MyBook drives that I swap out every quarter. One is never at my house, just in case something (like a fire) should happen so that I won’t lose all my data. I used online backup services, in my case, Carbonite. All these have served me well. Recently, I had the idea, since USB flash drives were becoming so small and cheap, that I might want to have a storage solution right on my keychain. Now, I’ve talked about USB flash drives before. 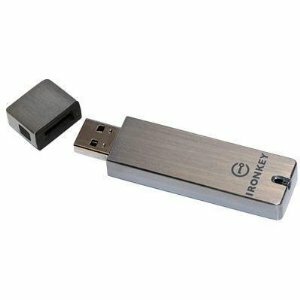 Specifically, the IronKey USB Flash Drive. I love my Ironkey dearly, but it is a bit of overkill and a little big to carry on a keychain. The IronKey is a very rugged USB flash drive. It provides military-grade encryption. It is waterproof and shockproof. It mounts as a CD which enables you to do some very interesting things with it and it even comes with a built in secure and anonymous web-browsers. The IronKey allows you to mount it as a read-only device, so it is the perfect tool to help troubleshoot a system you fear might be infected. The Ironkey offers a lot and I love mine. However, for my new purpose there were three problems with it. The first, is that it is the size of a normal USB stick. So it is a little large to throw on a keychain. I always have mine in my computer bag, but on a keychain? Don’t think so. Second, it is massive overkill for what I need. Third, it is expensive. All the fancy doo-dads it comes with cost a lot of coin and it turns out, you can give yourself a rough approximation for a lot cheaper. But the IronKey does what it does and does it well. My new flash drives were going to fall into the “want” category instead of the “need” column. So I established some criteria for the new flash drive. They had to be small. Smaller than a normal key. If they were going to be on my keychain, I didn’t want to notice them. They had to be cheap. Less than $20. I already have loads of expensive tech and don’t need more. Plus, writers are poor and need cheap backup solutions. They had to be rugged. The last thing we want from a backup solution is to try and use it only to find out that it doesn’t work. They had to hold at least 8GB. Now, this may seem like a lot given what we’re backing up. But honestly, it is getting hard to find newer USB drives that are smaller than 8 GB. After doing some research and trolling about the interwebs, I settled on three likely candidates. 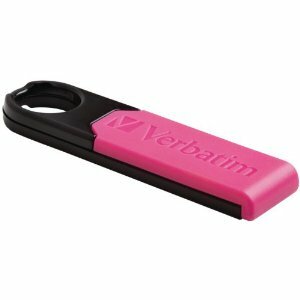 The Verbatim Store ‘N’ Go Micro Plus. The Verbatim Tuff ‘N’ Tiny, and the Kingston Digital DataTraveler SE9. I’ve been using these for roughly two months now and while I haven’t particularly beat them up, all three were on my keychain (until recently) and worked flawlessly. I even did some extra testing like submerging my keys in a bowl of water for 60 seconds. Once I dried them off, all three drives functioned well. Also, I should note that I always unmounted the drives after use (I don’t like to live too dangerously with my data.) So here is my quick review of each one. The Store N’ Go does what it does. Not fancy, but very affordable. First up. 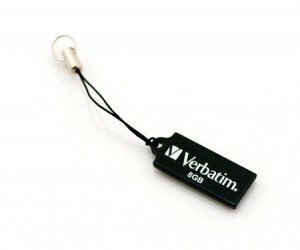 The Verbatim Store ‘N’ Go Micro Plus. Now, surprisingly, this is the most expensive of the bunch. Chalking in at just under $15 for 8 GB on Amazon. I like that the drive has a small rubber cover that goes over the connectors. The cover fits snuggly and keeps the connectors protected. The body of the drive itself has a hole that fits on the keyring. But the body of the drive is plastic, so it theoretically could break and fall free. The drive was responsive and keeps working well. UPDATE: Noticed today that the drive had broken off on the keyring. The ring portion was still intact, as was the cover, but the drive itself was gone. Due to encryption, I’m not worried about my data being out there. The runner up. Rugged and affordable. Lot’s of space in a truly tiny package. Next up, the Verbatim Tuff ‘N’ Tiny. The drive claims resistance to dust, water, and static discharges. It is really small, about the size of a quarter, I was amazed it could hold the information it does. The connectors have no cover, and that worried me a bit, since it was in my pocket with the keys and subject to getting scratched up. However, that never affected it. The Tuff ‘N’ Tiny also comes with a program called Vsafe100 that allows you to password protect a partition on the drive. You can then use it in any computer you want, you just need to execute that vsafe program, type in your password, and it unlocks the partition. It doesn’t have fancy encryption but it did offer some security in case the drive got lost. And here’s where we come to the part where the drive got lost. Sometime in the last week, the little lanyard that held the drive to my key ring, broke. I have no idea how, where, or when it happened. But the bottom line is that I no longer have the drive or my data. The good thing is, whoever finds the drive, can’t get to the data either because it is password protected by vsafe. Not bad, but the lanyard incident, makes that a deal-breaker for me. The winner of my impromptu competition? 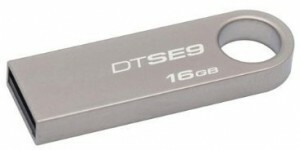 The Kingston Digital DataTraveler SE9. While it doesn’t cover the connectors as well as the Store ‘N’ Go drive, it does provide some shielding for them. It is rugged. It is cheap. I went ahead and got way more space than I needed because it was so cheap. Wow! And the body of the drive itself fits onto the keyring, just like the Store ‘N’ Go. Except that the Kingston has a metal body, so it won’t break. The winner of my informal competition. A tiny flash drive with a metal external casing for an extremely affordable price. Also, keep in mind, that a little extra room does help, since you can run some programs directly from a USB drive. For instance, I have Scrivener loaded on all these and can run the program from the drive itself. So that’s a nice little bonus. Having some extra room lets you keep all your research on the drive as well as your story. And I would dearly love to put on some kind of bootable OS environment right from the drive as well. That will probably be my next challenge. Now the downside of the Kingston and the Store ‘N’ Go is that they do not have security. No innate way to password protect the files on the drive or anything. So if you lose them, your data is just out there. That wasn’t acceptable to me and I found several solutions. The first is Bitlocker. Bitlocker ships with the Pro version of Windows and allows you to encrypt and password protect an external drive. The problem is that many folks don’t have the pro version of windows. Well, there’s an alternative. Truecrypt is a free, open-source, software package that provides on-the-fly encryption. So you can download Truecrypt, and quickly make an encrypted file, partition, or even encrypt the entire drive if you want. And it provides an easy way to lock your drive so that no one can get your data if it gets lost. The downside is that you’ll need Truecrypt loaded on each computer you want to read the drive on, but that’s not a concern if you’re only using the drive on your own machines. In the case of an emergency, you would have to load Truecrypt first to unlock the drive, but at least your data would be secure and you’d have a backup copy, right on your person. Barring those solutions. MSWord allows you to password protect a file. Or you could always zip your data into a zip archive and password protect that. I chose to go for the Truecrypt solution. In any case, hopefully, this post has given you some insight on just how inexpensive and versatile USB flash drives have become.